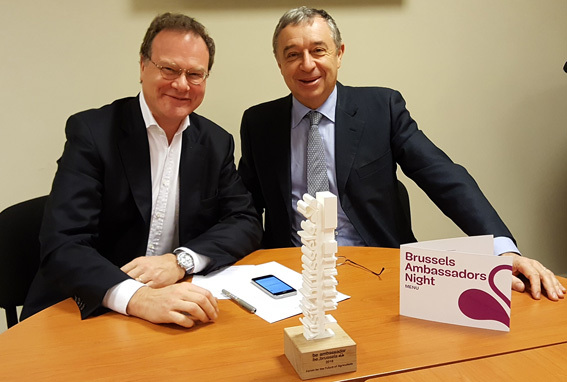 The Forum for the Future of Agriculture (FFA) was recognised recently as visit.brussels presented Ambassador awards to the partners who, over the past three years, have contributed exponentially to propagating and supporting Brussels as an international Meetings, Incentives, Conferences and Events (MICE) destination. In front of an audience of academics, doctors, European Commissioners, deans of universities, chairmen and board members of international associations based in Brussels, scientists, hospital directors and other destination partners, the new ambassadors were praised for their efforts and help in bringing major international events to Brussels and reinforcing its image as ideal MICE destination. 130 people participated in this first edition of the Brussels Ambassadors Night. visit.brussels used this event to launch a new network that can be activated to allow new international events to take place in Brussels. This will enhance the Belgian capital's international appeal and promote its local expertise and strengths. In addition, it also wishes to focus the attention of the Belgian academic and economic spheres on the importance and the advantages of having an international event on their specific field take place in Brussels. The Brussels-Capital Region ranks as Europe's number one convention destination, and second worldwide (according to the Union of International Associations). Put together, the conventions were responsible for 2,710,000 overnight stays in 2015. The impact of these events gives rise to total revenues of 632 million euros per year, and keeps over 18,000 people employed. The award winners of the Brussels Ambassadors Night, including FFA, contributed greatly to this result.